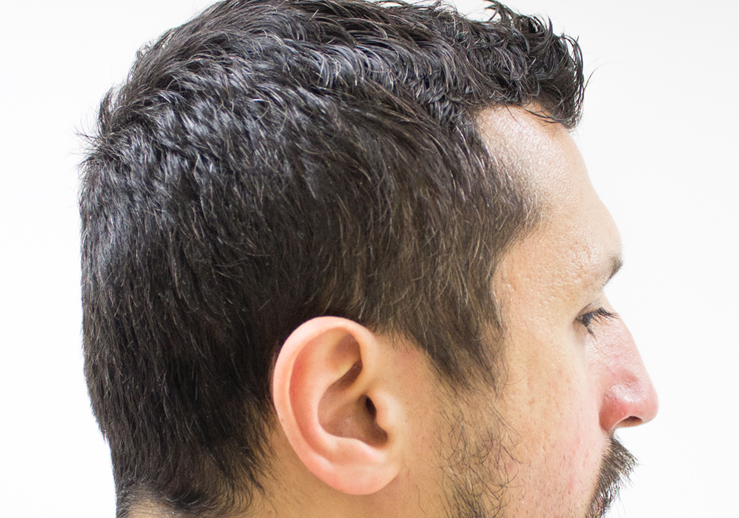 REPAREX is a special cosmetic preparation that will restore the original color of your Gray hair. REPAREX will remove Oxygen from oxidized colorless melanin causing hair graying through the enzyme α-reductase that binds with silver acetate and results in restoration of melanin’s original natural color. Thanks to this process, each and every of your hairs regains their original natural color along its whole length. Reparex contains no foul odor or harmful ingredients. Reparex for Men is specifically formulated to fit well with the male body chemistry. It retains the original color of your hair for a long period after a single wash, and is cost-effective. Removal of oxygen from the hair ensures that no graying components remain in your hair. The product works as advertised, it is no that easy to use for men with longer hair. Best gray conversion ever-been using it for a year works perfectly with once a week application for beard and hair. Does not look dyed! I started using Reparex few months ago, and I did not see much of a change for few weeks. My hair would always get a little bit brownish and the effect would not last. I was frustrated, and I called Daniel. He was very nice and extremely helpful, and I realized that I was not applying Reparex right. I did not massage it in, and basically just left it on the surface of my hair. Once I started following Daniel’s instructions, things started to change, and I can now recommend Reparex to everyone. I am now on my third bottle of Reparex, and love the product. I have fine hair, and started using it when my hair was still 90 my original color, and only took me about a week to see results. I didn’t read the instructions so, I was applying it every day to dry hair and ended up with a purplish hue. 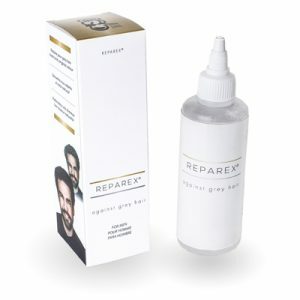 It didn’t bother me too much and I powered through it, and since then, I apply Reparex once a week and I am able to Reverse Gray Hair and maintain my natural color. I originally worried about what would happen if I went away for few week, but I now just skip a week or two and then catch up. I can go for two weeks without reapplying Reparex, and don’t see a dramatic change. I also like that Reparex gives me stronger and fuller hair. I have used this product for two months now, and here is what I can say about it. It is a really good product, and the concept of supplying the hair roots with a reducing enzyme (to reduce oxidized melanin) is really cool. I’m excited about this product! I used it once a day during the first two weeks, and twice a week thereafter. I saw effects as early as 4 days after using it, and I could see a few gray hairs here and there that were brown at the base. Some of my non-gray hairs got darker too. I really like the nozzle of the bottle. It makes it very easy to use the product and direct it to the scalp. However, there was not much progress after that. So I supplemented the remaining product with 20 mg (may be too much) of recombinant glucuronate reductase, and the product became much more effective! So I can conclude that the levels of glucuronate reductase that the manufacturer uses in this product is not enough, at least for some people who are less responsive to the product. So I would recommend the manufacturer to produce a “high-strength” version of this product (with more glucuronate reductase) for people who don’t respond (well) to the regular product. The only thing I don’t like about this product is the inclusion of silver nitrate as it stains everything it comes in contact with. This is a huge inconvenience. My understanding is that silver nitrate is included as a disinfectant so that bacteria or other bugs don’t start growing in the bottle and destroy the enzyme. Is it possible to use a different disinfectant though? I’m sure there are other disinfectants/antibiotics available out there. Overall, this is the best Gray Hair Cure product. great product. Its works as described. Just be careful on your white ceramic or enameled sink because it leaves stains that you can’t see right away (they turn purple the following day). So you better use it while protecting the below surface with, I suggest, an old towel that you don’t care if it gets stained. thats the best way I found..
Not for hair, just the beard. Works great lasts long. I bought this product for my boyfriend. He has been using Just for Men, however, he has used Clairol and a couple others before. This one he likes because it has no odor or harsh smell. He also likes that he has his natural hair color back and it doesn’t look like dyed hair anymore. You know how you can tell if someone dyed their hair. With this it looks amazing! I found a “How to” YouTube video that made it super easy. Go to their website: SimplyGreatStuff.com and click their Youtube icon. Its easy to use but I didn’t have to make sure he used it. He kept forgetting! However, once he got to the color he wanted, the maintenance is super simple that i didn’t have to remind him anymore. Great product and arrived fast. 5 STARS !! works just as described and gives you the salt and pepper look, if that’s what you desire i.e. Good stuff! Really seems to work! With numerous colors to choose from you’ll be able to match the perfect tone of your hair color. This is an amazing product that will yield excellent results. One of the things I like most about this are the ability to do this without the salon prices and on top of that being able to get that color back without harsh chemicals in synthetic ingredients. Grays no more! This is better than hair dye! Works very well, if you follow the recommendation. The color hair turn back. Bye bye white hair. Repeat buyer. Works as advertised. Follow directions. Only needed something to keep my hair looking like natural color. This did the trick. I would recommend for sure. The product works in removing gray hair. However for me it doesn’t restore my natural hair color. I have dark brown hair and Reparex removes the gray it has my hair color more medium brown. Don’t get me wrong I like that better than the gray but not seeing my natural hair color. I do recommend the product though. My gray hair started coming in around the edges of my hairline and I just wasn’t ready to be gray just yet! So I decided to nip this little problem. The product worked great! I look and feel much better now. I didn’t see results immediately but I kept using it and it worked. I really liked this because it was gradual so no one noticed. Wow! Throwing that drinking Grecian Formula in the trash. Todd of the silver smell. THIS stuff really works and fast! It lasts as long as Grecian but talked less time and DOES NOT STINK. This is like Just For Men, but does not Burn and scaled your skin like that product. I put it in a small pump spray bottle that was a travel size hair spray bottle. Be sure to use the gloves and don’t spray on your face. WILL BUY AGAIN, in fact, I’m buying another bottle to store in case they stop selling it. Excellent product, have reached all my expectations! Better than a salon service. Great Product !!! The power of science. In only one week, I have seen the difference. I would recommend it. I have been using this product for years and it works perfect. Although a bit slow, the item arrived in good condition. As I have used the “Reparex” before, I am satisfied with this product and I can recommend it to anyone. My Dad loves the product! He had total white hair, and when he first started using the product his hair turned red-auburn for 4-5 days then light brown to dark brown and it is getting closer to his natural black after 2 weeks. He has severe allergies to para-phenylenediamine (ppd) hair dye and can’t use the majority of hair dyes. He stated the two great selling points for Reparex is that it 1) claims to restore your natural production of dark melanin with benefit of silver nitrate darkening of hair and 2) ppd free and other harsh chemical free solution. Great for people with allergies to other products, just keep using till you achieve the desired color. works well. A little pricey though. Great stuff. Have used it for several years. Real natural. Amazingly effective – I went from being substantially gray, to regaining the color I had in my twenties – with just six applications, and in less than two weeks! Yes, your hair will pick up a reddish tinge from the silver oxide, which washes out eventually. But what you end up with is the most natural-looking color, because it’s you own pigment, not some phony dye. There’s no chemical odor, and in my case, the amount of product required was ridiculously small: perhaps one teaspoon per application, and only about 1/4 of the bottle overall to obtain the results seen in the pic below. I have not used it in over a week and my color still looks great; small amounts should be sufficient for occasional touch-ups as the graying process naturally occurs. Reparex is one of the most amazing products I’ve ever used. Your mileage may vary, but given the relatively low cost, it seems worthy of a try. Excellent product and speedy service. Very good product it cover the white hair perfectly! Great product, but needs some improvements!! Excellent product. I had issues with allergic reactions to most men’s hair color products so I tried the Reparex product. You have to use it every 2 days until you have your normal color back. Try to use the smallest amount possible or you get a copper color in your hair (that washes out). Once you are at the desired color, use only once a week maybe twice. Use gloves when massaging into your scalp to prevent discoloring of your finger nails. Follow the above and you will have natural looking hair color with no allergic reactions, no change in texture, and no smell. Very happy with the results. Very good result. Loved It !!! This stuff is absolutely amazing!! I’ve been looking for something that will actually deliver what it promises, and I’m really happy to say…THIS DOES JUST THAT! Touch of Gray is perfect for men as it appears natural – no “off” colors or colors meant for women only – and, it is very easy on the scalp. I have a very sensitive scalp and this is one of the only hair colorings that do not irritate my scalp whatsoever. And, since it has time-sensitive coloring action, you will not end up with a shocking result if you leave it on too long. People cannot tell that you have used this product; so, to me, this the perfect product to use! It’s quick and easy. I have short hair, so I bought a separate applicator bottle and I can actually get 2 dyes from one box. I’ve been using it for years with no issues! The product worked great! I look and feel much better now!! I would recommend this. It really helps gray hair. Thank you. Very good product and service. I will continue ordering when I need to. * Disclosure required by Google: These are testimonials of individual users. Individual results may vary.